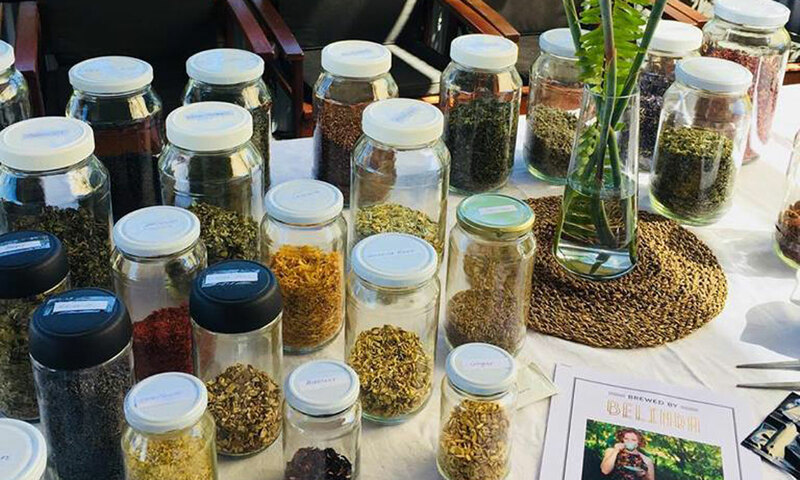 Blending a love of tea with her passion for the arts has proven a winning formula for Adelaide aspiring tea master Belinda Hellyer, whose creative blends have earned national recognition and struck a chord with tea drinkers and arts organisations. A few weeks ago, Brewed By Belinda scooped two medals at the national 2018 Golden Leaf Awards held as part of the Australian International Tea Expo – including a gold for its Creativitea herbal blend. It was a big deal for Belinda Hellyer’s small business – run from a room in her Alberton home – and fortuitous timing, coming just as she left her part-time job in the arts to focus more on building her tea business and brand. “To have that industry recognition was a huge thing for me,” she says. Hellyer has spent most of her life working in the arts, initially as a performer doing improvised and character comedy, then in the production and administration side in Melbourne and Adelaide, including with Adelaide Fringe and most recently as development manager at Restless Dance Theatre. Her husband, Stephen Noonan, is also a performer. It was while Hellyer was on maternity leave from Fringe that the idea for Brewed by Belinda started to take form. “It just hit me one day that I could combine my love of arts, which had been my whole life to that point, with my love of tea. Hellyer completed a certified tea blending course with training organisation Australian Tea Masters, based in Geelong, and at the end of 2015 she launched her own artisan tea business with a range of blends “inspired by the arts” and described as being “made with jazz hands”. Her 13 all-organic blends are intended to help people access their creativity, and come with names such as Opening Night Nerves, Standing Ovation, Stage Kiss and 5-Minute Call. Now, Hellyer is close to finishing a Certified Tea Master course with Australian Tea Masters, and says her business is being buoyed by consumers’ increasing interest in the potential health benefits of tea and the origin of ingredients. Hellyer has done extensive research to find suppliers, sourcing ingredients such as black tea from India and Sri Lanka, and white tea and green tea from China. Where possible, however, she buys her ingredients locally, including chamomile, peppermint, spearmint, orange and lemon peels, rosehips and hibiscus. Her best-selling tea, Creativitea, won the gold medal for best natural rooibos blend in the recent national Golden Leaf Awards, which sees professional “cuppers” from all over the world judging a range of teas against criteria that would rival that of a CWA baking competition. The caffeine-free Creativitea is made with honeybush, orange peel, gotu kola, chamomile, lemon balm and red rose petals. Gotu kola, for those not in the know, is a herb often lauded for its reported brain-boosting capabilities. “The monks used to use it to meditate – to still their mind and body for meditation,” Hellyer says. 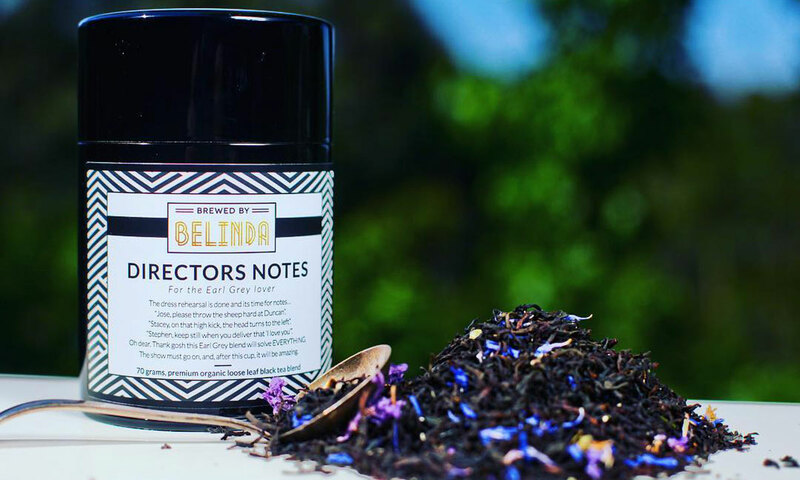 Other particularly popular blends include the Standing Ovation, a white tea blend made with red rose petals, which won a silver at the Golden Leaf Awards; the Directors Notes (an Earl Grey blend) and the new caffeine-free chai, Stage Kiss. With a little more time on her “jazz hands”, Hellyer may add a couple of new blends to her range, but is primarily interested in building more awareness of her brand and increasing her number of stockists. The teas – which can be bought in hand-made Japanese tins – are currently sold by an eclectic range of Adelaide outlets, from Alberton community café The Pear and North Adelaide’s E for Ethel café, to a boutique furniture shop and a city yoga studio which brews it each day for yoga students. Brewed by Belinda is preparing to make its debut at the Bowerbird design market at Adelaide Showgrounds next month, and Hellyer plans to pursue further collaborations with arts organisations. “When I started I thought I would love the tea to be given to artists on opening nights. The Adelaide Festival, Adelaide Cabaret Festival and Arts Centre Melbourne have all included her teas in gifts given to performing artists. Most recently, Hellyer has worked with Malthouse Theatre in Melbourne to create two custom blends – called Bravo and Five Stars – which were gifted to donors at its 2019 season launch. “There are the sorts of collaborations and relationships I’d love to do more of. For those interested in learning more about the art of tea or having a go at blending themselves, Hellyer has also started running a series of blending and tea appreciation courses which can be booked through her website.